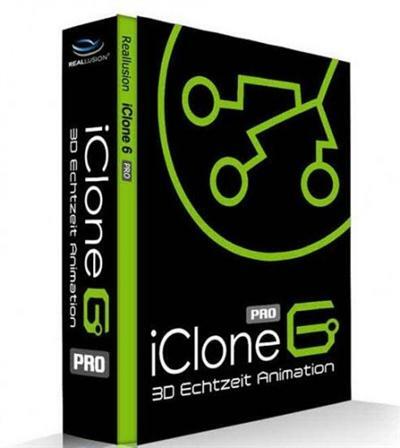 iClone 6 is real-time 3D animation for digital actors, virtual environments, visual effects with drag & drop editing, powerful physics and easy plug-in compatibility, designed for creativity in storytelling and broadcast production, education & previzualization. Professionals and beginners can take advantage of tons of pre-made content and smart interactivity between actors and environment that make animation fun and intuitive. Easily create & customize, direct actors, props, scenes, vehicles, lighting, cameras and dynamic material channel settings, all with stunning ultra-realistic rendering. - Director-oriented layout: Actor, Prop, Scene, Animation, SFX. - Intuitive dockable UI with various workspace adjustments. - Scenes are built with drag-n-drop with convenient in-screen editing. - Optimized Content Manager with quick search, content pack view, folder creation, and online inventory. - Timeline enhancements with dope sheet, multi-track editing, and zoom view. - Brand new one-mesh, morph-based G6 characters with enhanced facial details and textures. - Collision shape editing for interacting with physics enabled objects. - Multiple character styles for human and non-human types. - Outfit switching with verstile styles for outfits, hair, and accessories. - Facial animation with advanced puppeteering, auto lip-syncing, and motion key editing. - HumanIK body animation control and motion layer editing. - Instant performances with Persona characteristics (personality & emotion). - With Look-at camera and path motion constraints. - House and Interior elements for detailed scene setups. - Natural world system: Terrain, sky, water, grass and tree. - Sky Tool: Interactive sun, moon, sky and cloud generator. - New SpeedTree technology with natural wind and visual improvements. - A free-to-drag & duplicate light prop system with dimmer and flash control. - Multiple camera systems with live switch and mini viewport. - Camera lens options with DOF range settings. - Advanced soft shadow effects. - Real-time Surface Smoothing resulting in detailed surface appearances for low-poly objects. - Toon Shader and key-able Post Effects. - HDR, IBL, and AO for enhanced atmospheres. - Real-time particle emitter controls for smoke, fire, and explosion effects. - Multi-texture channel for realistic visual appearances. - 3D-to-video composition effects by feeding in video textures into selected channels. - Dynamically change material looks or animate building materials. - Compatible with hundreds of Substance material libraries. - Add real-time geometry details to any model by using the new Tessellation technology. - Easily define smooth cloth transitions with grayscale maps. - Apply natural wind behaviors to skirts and hair. - Design sophisticated physics structure with the Visual Constraint tools. - Add Rotational and Directional Forces to physically animate objects. - Quickly switch real-time render modes for optimal visual and editing performance. - Export Image Sequences with Alpha Channels for video composition. - Supports major image and video formats up to 4K (Super HD). - Super Sampling output for flicker-free visual quality. - Ultra-realistic rendering with the Indigo Ray-tracing Plug-in.